Playing catch-up here a little bit. There are tonnes of photos to share from Market and my Pittsburgh, Lancaster and Gettysburg trip. I created five quilts for the Spring Market booth. Thankfully, Judy from Patchwork Times did her long-arm quilting magic for the two large map quilts. I didn’t sleep very well that week I shipped them off to her. Obviously, they arrived safe and sound, and Judy brought them with her in her carry-on luggage to Pittsburgh. I took the letter printouts and used paper spray glue to attach them directly to the heat and bond fusible backing paper. I cut them out, fused them, then used a tiny zig-zag stitch around each letter. Then I pieced the blocks into the quilt. I highly recommend using the spray or even a glue stick to attach pieces of applique to the fusible paper. A huge time saver than tracing them. Not one shifted or fell apart as I was cutting it out. I used one of my sewing machine’s fancy stitches to quilt between each block and to apply the binding. I cut 5″ charm squares from the left-over fabrics to make a table topper quilt as shown in the picture above as well as the two bowls. Eventually, I stumbled across this site, World Atlas. I downloaded their free maps, and imported them into Photoshop. The Staples at South Keys (for the locals) has a drafting printer. After determining the maximum width available, I blew up the outline maps in Photoshop and took them to be printed. At the last minute, I realized I forgot to reverse the images, but the guy that helped me did it for me before printing. I had the US map printed in reverse and non-reverse so I could transfer the state lines directly to my fabric once the body had been cut out. Total cost to print the six sheets needed was ~$30.00. Keep in mind, I have a very small sewing area. Dealing with these large printouts was challenging. For two weeks I had rearranged the furniture in my living room, so that I could have two tables stacked together. 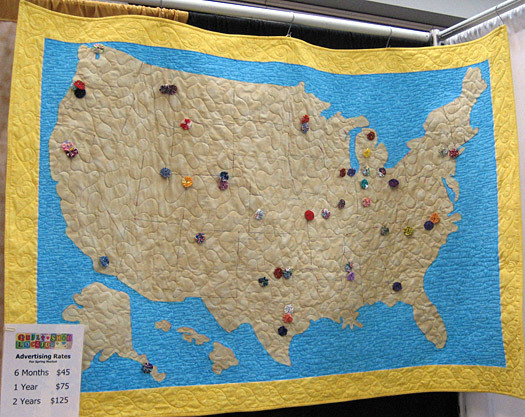 I started the US map quilt before I bought the spray glue, and was using a glue stick to attach it to the fusible web. What a nightmare. There just wasn’t enough table room to lie the papers out flat in order to attach the paper backed fusible web. What I ended up doing was just a 1-2″ edge of fusible web around the outline area that would be attached to the backing fabric. I do not recommend doing this. It turned out OK, but it was very difficult to work with. Trying to iron it and keep the huge piece of fabric flat resulted in many grey hairs! For the world quilt, I used the spray glue and fused the full area of each of the pieces. Definitely a lot easier to work with and no unwanted puckers. Sure, it took FOREVER to fuse that down, but I was happier with the final results. I used a tiny zigzag stitch with a multi-coloured thread around the edges and then the same to indicate the state lines. To transfer the state lines, I used a herra marker then went over that again with a coloured marker, as the indentations weren’t deep enough for me to stitch. Judy did a fantastic job quilting and binding these two quilts for me. I could never have managed it on my domestic machine. They finish around 50×70″. While there isn’t any room in my office or sewing area (a wall of windows), I’m thinking to keep the USA quilt in my bedroom where there’s an empty wall waiting for a quilt. 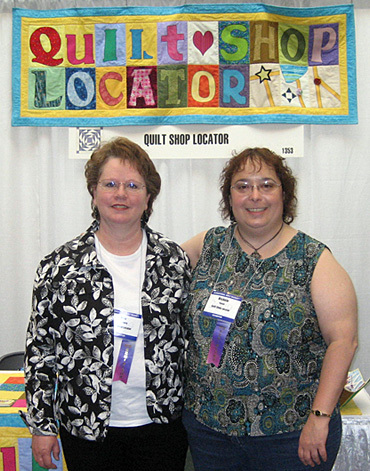 I’ll keep adding yo yos as more shops sign up for the Quilt Shop Locator. Seems a shame to hide them away in a suitcase until the next show. Finally, a photo of Judy and I in the booth. Michele, I LOVE these quilts! What great ideas these were for your booth at Market. I would definitely keep at least one of them out where you can see it, admire it, and be proud as it fills up with yo yos, as I’m sure it will. Kudos, they’re fantastic! So nice to meet both you and yours at the Sharon Schamber workshop. Hope you arrived home safely. Have a couple of photos of you durning workshop so will sent them on asap. 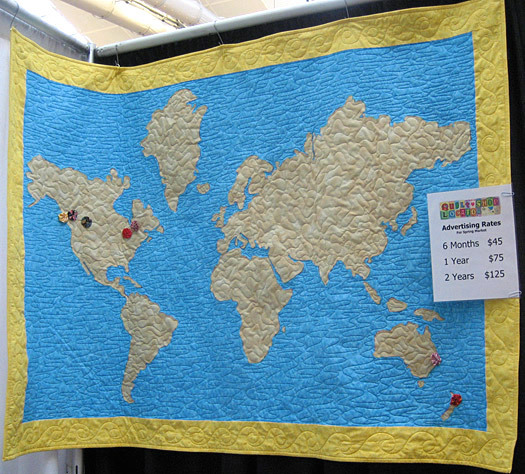 I love your map quilts, what a fun way to watch your business grow! Everything is better with fabric…. Great tip about the spray glue. I have such a tough time with applique some times, so the next time I venture into that arena I will try the spray glue. yes everything is better with fabric, thanks about the spray glue i wish i knew every little tip out there!